The Arsonist is made by Matchbook Wine Company, one of my favorite wineries, and you can read all about their great story in my article “A Brief History of Matchbook Wine Company“. The Arsonist Red Blend is my January Wine Pick, and I’ve got a few more Matchbook wines coming up after that to review. 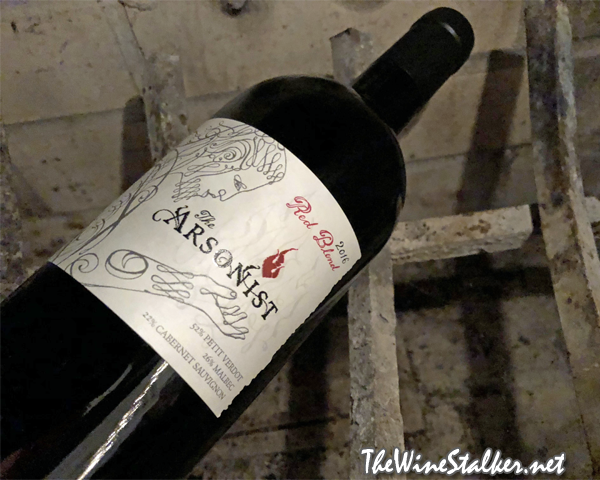 The Arsonist Red Blend 2016 is 52% Petit Verdot, 26% Malbec, and 22% Cabernet Sauvignon out of Dunnigan Hills, California. I reviewed the 2012 vintage for the website back in 2015, I got to taste the 2013 and 2014 vintages but it was off of the site, and I reviewed the 2015 vintage for the site in 2017. Since the 2013 vintage it’s been one of those wines that everybody loves once they try it. And today I’m making the 2016 vintage my wine pick of the month for January of 2019. The color of the wine is a gorgeous garnet. Even from a distance you get this floralness of rose petals and orange blossoms coming from the glass. Come in closer and there’s aromas of cassis and dark chocolate. Also, the root beer that I get on every single vintage is still there. On the palate it’s medium bodied with chalky tannins and a little pep in its acidity. There’s flavors of blackberries, grape juice, dark chocolate, and root beer. Then it finishes with the acidity brightening the fruit. Like I said, I have yet to meet anybody who didn’t enjoy this when they taste it, and it’s my go-to suggestion for a $20 red blend.